SCI Chapters, individual SCI members, church groups as well as groups of school children or scouts fill these Blue Bags with much needed school and medical supplies, clothes and food items as well as playground items for the children. The contents of these bags may include medical, educational, and other relief supplies, or clothing and toys. 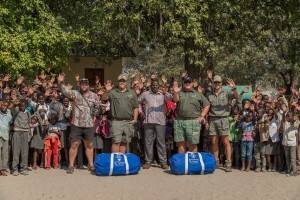 SCI members, fellow hunters and their friends, who are traveling to the hunting and safari destinations of the world, will take these Blue Bags and distribute these much needed items to children and families all over the globe. These “humanitarians”, with the support of their outfitters and friends, will deliver the contents of these bags directly to schools, clinics, churches, orphanages as well as to teachers, doctors, caregivers and mission workers to use in support of all those in need. Are you going on a safari soon? What can I put in a blue bag? Dr. Peter Nalos, his wife Karen Nalos and daughter ON Opre “Pay It Forward” in a MIGHT WAY!!!! 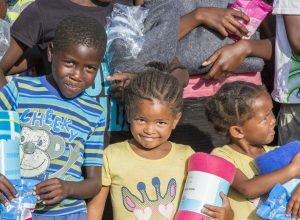 During their recent trip to Ethiopia to open several new schools on behalf of #AfricanChildrensSchools, the Nalos Family shared several SCI Foundation Bell Family Blue Bags with the children of Ethiopia. These blue bags were filled with much needed supplies to help stock the schools. They also delivered food supplies, medical supplies and clothing items for the children of these local tribes. All this in addition to building these tribes and communities a new school. African Children's Schools is a wonderful charitable organization that is building schools in several strategic locations in Africa. Amy Bell Charities is so very blessed to be partners with the Nalos Family and African Childrens Schools in several of those projects. Our deepest thanks and gratitude to the Nalos/Opre families for including the Blue Bag program in their amazing ministry to those less fortunate. They live “Pay It Forward” in every aspect of their lives. God bless you Peter Nalos, Karen Nalos, ON Opre, TA Opre and everyone associated with Africa Children’s Schools. You are a shining example to us all. This is such a wonderful blessing to so many. God bless you! Excellent, Olivia! Proud of you! Great you are number one in africa to opening the schools spencialy for remot area. its wonderful i pleasured to for your work be strong i pray for you!!! I’m so very proud of all that y’all do!! Such a tribute to Amy! THANK YOU TO EVERYONE and HAPPY NEW YEAR from Amy Bell Charities. Thank you to all of you who have helped us “change lives” all over the world in memory of our founder Amy Bell. Through this short video we hope to highlight some of the many people who helped us continue the amazing work that Amy began. Enjoy!!! Merry Christmas from Amy Bell Charities. We have so much to be thankful for at this special time of year. We want to wish all our faithful supporters around the world a Very Merry Christmas. Enjoy this short video that highlights just a few of the hundred’s of “SCI Bell Family Blue Bag” presentations that have taken place all over the world. Merry Christmas to your family! God bless you always!! We love you Amy Bell and we miss you daily. But your legacy of "Pay It Forward" continues. Before her passing on May 16, 2014 Amy was so full of life and laughter. Her travels and life experiences had enabled her to build deep friendships all over the world and she developed a huge heart for children. Through her personal philanthropy she had begun a wonderful legacy of supporting and serving children both here in America and around the world. After her passing we found ourselves in a state of shock and grief. It was out of our grief that we developed an everlasting commitment to "continue Amy’s legacy". Amy had begun that legacy in a very quiet and private way. But once the depth of her works became known to her friends and family we realized that she had established a legacy we could not ignore. We all made a commitment to build on her good works which then led to the establishment of Amy Bell Charities and the Amy Bell Charities website (www.amybellcharities.org). Enjoy this brief look back at her life and legacy. Her spirit lives on in so many places and people. May God continue to bless her work as we continue to honor her life and Pay It Forward. What a kind hearted and generous young woman she must have been to do so much good in so short a time. Thank you so much Tim Fallon Susan C. Fallon for “Paying It Forward” in memory of Amy Bell in such a special way. She loved you and all your team at FTW SAAM very much. Amy Bell Charities is in Fuzine, Primorsko-Goranska, Croatia. The entire community were very appreciative that we chose them for this “Pay It Forward” gift. 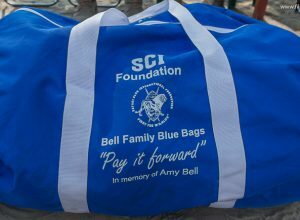 The SCI Bell Family Blue Bags continue to show up in some of the world’s most remote places. A few weeks ago, Jordan Hasler and Dr. Gerald Warnock, together with Barbara and Alan Sackman, all traveled to Liberia. 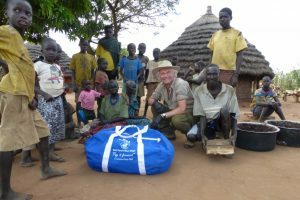 With the help of Morris Dougba, these longtime supporters of the Safari Club International Foundation visited the very remote village of Kraainem to deliver a very full Blue Bag to a very small primitive school in the area. The bag was filled with some much-needed school supplies, a few treats and toys, along with soccer balls and other recreational supplies for the children. All of these “treasures” were very much appreciated not only by the children but also by the teacher of the school. Thank you to Barbara and Alan, Dr. Warnock and Jordan for “Paying It Forward” in memory of Amy Bell and in support of this important SCI Foundation program. 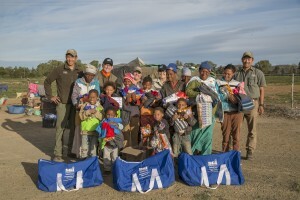 BLUE BAGS ACROSS THE GLOBE – Amy Bell Charities and the West Texas Chapter Safari Club International (WTSCI Foundation) donated 12 Bell Family Blue Bags to be carried to children less fortunate all over the world. These bags are destined for Namibia, South Africa, Tanzania, Russia, New Zealand, Kyrgyzstan and 3 different locations in North America. 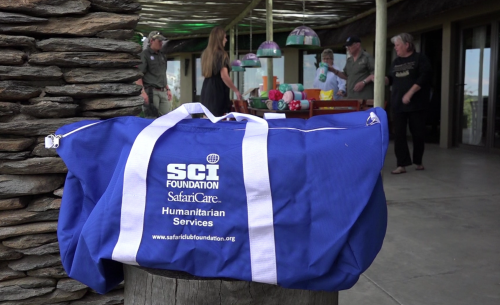 Bob Benson, executive director of the Safari Club International Foundation joined Ellen Bell and Larry J Bell to assist in distributing the bags. During a recent trip to Austria the Bell family learned of a special need at a school for handicapped children. The teachers at the school had been searching for funding for some much needed playground equipment at the school. They had contacted some local citizens who were willing to provide the labor for the project but they needed some funding for the supplies. 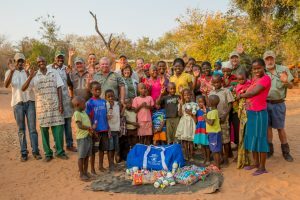 The Bell's arranged a special "Love Gift" to purchase the supplies and the project was a go. The smiles on the children's faces as well as the teachers and workers says it all. You all are so helpful to so many, thanks so much! They love that you all care!